It’s finally here! 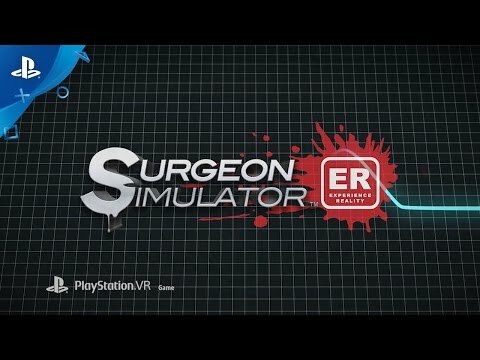 Surgeon Simulator is taking the ER to VR! Experience the critically acclaimed and infamous surgery simulation game as you have never seen it before! Built from the ground up for VR and featuring all of the surgeries and twisted humour of the original favourite. Taking the ER to VR! It’s finally here! Surgeon Simulator is taking the ER to VR! Experience the critically acclaimed and infamous surgery simulation game as you have never seen it before! Built from the ground up for PlayStation VR and featuring all of the surgeries and twisted humour of the original favourite. This is one surgical experience you will never want to forget! Surgeon Simulator: ER transports you into some of the most unlikely and possibly unsanitary surgeries possible. Bob’s life is in your hands in this darkly humorous VR game. Let us transport you you closer to bloody surgery than you possibly ever wanted to go. Scrub up, are you ready? Surgeon Simulator: ER is compatible with both Dualshock and Move controls to cater to every budding backstreet surgeon’s technique.